Welcome to the FSI registration page! Read the instructions carefully, and follow the steps below to register for FSI. Click this link for additional FSI information and brochure. Continue on with Step 1 below to begin the registration process. Please choose either Individual or Family Registration Fee and click “Add to Cart.” You will be redirected to your cart. Once there, click “continue shopping” (see example below in step 2) and proceed to Step 2. Base Price: 410.00 - 650.00 plus optional electives, additional options, and graduation fees. This is a multipage form that includes all elective options plus additional options and graduation fees. All electives, additional options, and graduation fees are completely optional if not needed. PLEASE NOTE – You will need to fill out this form for each student that you are registering (i.e. you will need to click “Add to Cart” for each student that you are registering). If you need to fill out more than one tuition form, complete the form and click “Add to Cart.” You will be redirected to your cart. Once there, click “Continue Shopping” as illustrated below. You will be redirected back to this page to fill out another form. Please look for a confirmation email once your order is paid for and complete. Your confirmation email lets you know that we have received your order. Student Tuition: Violin, Viola, and Cello Books 1-3, and Guitar/Flute all levels. Intermediate Tuition: Violin, Viola, Cello books 4-6. Advanced Tuition: Violin, Viola, Cello books 7-10, and non-Suzuki students playing at these levels. Choose a t-shirt size. One shirt is included with each registration. 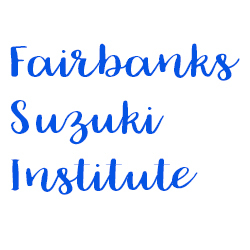 The Fairbanks Suzuki institute asks for permission to use student photographs and names and Institute information as part of mass-media, print, and/or online public information in recognition of the Fairbanks Suzuki Institute. Please understand that images published on the world wide web are not fully protected under copyright laws. I accept full responsibility for my (child's) instrument, actions, and behavior during the Institute week. 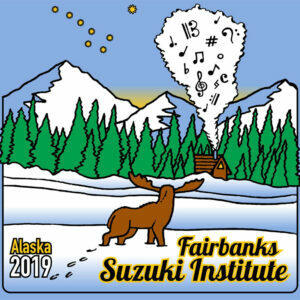 I will not hold the University of Alaska Fairbanks or the Institute staff accountable for any personal injury or damages which may occur during the Institute that are not caused by the Institute or the University of Alaska Fairbanks' sole negligence. If desired, please choose your electives by adding to the cart, then choosing the electives in the pop up form. If electives aren't desired, please proceed to Options. See brochure listings for age and experience level requirements. Group 1: Student Curriculum (Limit 2) - Fiddle (book 2 & above), World Rhythms (Students must be at least 10 years of age or in Book 4 and above), Note Reading Basics (book 2 and above, must have finished first grade and playing latter half of book 1). **Flute Student Electives include the following: Fiddle (book 2 & above), World Rhythms, & Chamber Music. ***Guitar Student Electives include the following: Fiddle (book 2 & above) and World Rhythms. Group 2: Intermediate Curriculum (Limit 2) - World Rhythms (Students must be at least 10 years of age or in Book 4 and above), Viola for Violinists (need to be in Book 4 and able to read viola clef). Minimum playing level for Chamber Music is Book 5 or comparable level and must have taken Viola for Violinists or be concurrently enrolled. Group 3: Advanced Curriculum (Limit 1) - World Rhythms & Dalcroze. Must enroll in Viola for Violinists if not familiar with viola clef or haven't previously completed the class. Student Curriculum - Choose your first elective (one only). Student Curriculum - Choose your second elective (one only). Intermediate Curriculum - Choose your first elective (one only). Advanced Curriculum - Choose your first elective (one only). This step offers a few more options. Lunch Art - $50 The perfect way to keep both Suzuki and non-Suzuki students and siblings occupied during the lunch break so that parents can attend the FSI Suzuki parent lectures. $50/per day. Adults who are not attending as Suzuki family members or are not enrolled in the teacher training class are required to enroll as observers. Please enter the number of days you are purchasing under quantity. Leave blank if you choose not to purchase this option. For questions, please contact Audra Carlson at 907.699.4805 or at fullcircleatite@gmail.com. For general graduation information, please visit the appropriate FSI webpage. Quantity = Number of levels you expect your student to graduate. What level(s) Will your student be expected to graduate to?